Is there anything to add for a card of this visual magnitude? If only TCMA's "yellow wave" didn't obscure the Mets logo, we'd have a blue, red, and orange miracle of modern fashion. Don't know about you, but I would love to have that shirt. As equipment manager, I bet Mr. Wiener contributed a great deal to this story, courtesy of the team's Wikipedia entry. "In one of the more interesting moments in franchise history, on the evening of 22 June 1978, Mets outfielder Mookie Wilson married Rosa Gilbert at home plate in Smith-Wills Stadium. The ceremony concluded with the couple walking back to the dugout beneath an archway of bats held aloft by Mets teammates. Wilson would become one of at least a dozen Jackson Mets players to wed girls they met during their tenure in Jackson." 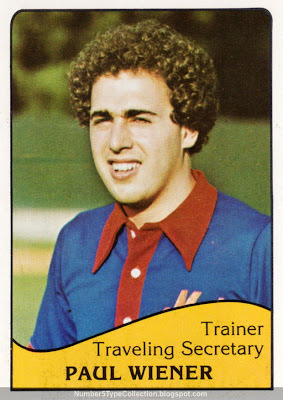 Jackson (Mississippi) served as the Mets' AA affiliate from 1975 to 1990, before moving to Binghamton, NY, a good deal closer to the home team. Value: This card cost $1 on Beckett Marketplace, typical for players that didn't find success in the majors. Fakes / Reprints: Haven't seen TCMA minor league reprints in the market, as there's not enough demand to make them worthwhile. 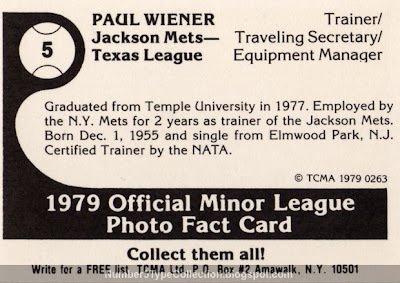 I also wonder if Mr. Wiener reviewed this card and said YEAH OKAY WHATEVER. Plenty of them feature squinting players--this is the king.